I don't mind longer lines at airports, or taking off my shoes, or undergoing a pat-down search, or answering extra questions. I try to be extra nice to the security personnel to compensate for the grumpiness I know they face. But one has to wonder whether the Homeland Security folks are setting the right priorities when they continue to forbid "ethnic profiling" for airport screening, but cuff and stuff into a squad car a 52-year-old teacher who's been caught attempting to board an airplane while in possession of a bookmark. 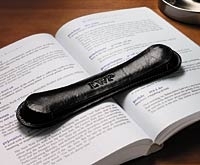 Actually, from the description, I suspect that the "concealed weapon" for which this poor woman now may face a potential $10,000 fine — an "8½-inch leather strap, with small lead weights at each end" — wasn't actually a bookmark per se, but a bookweight, like the one shown here from the marvellous Levinger company, which markets "Tools for Serious Readers" rather than "Tools for Terrorists." Yes, yes, none of us thought of boxcutters as terrorist weapons before 9/11 either, I know. And with a total weight of eleven ounces (with the leather-enclosed weights at each end probably accounting for about five ounces each), this item could indeed be used to raise a knot on the head of an ill-behaved teenager's younger sister. But a blackjack, it's not — those usually don't come with monograms, to my knowledge — and you could do more serious damage with your average hairbrush or, for that matter, your average hardbacked book. I've given these out as Christmas presents to bookish friends, without worrying much about whether I was promoting skyjacking in the process. Earlier this month, state attorneys declined to prosecute the case, but the teacher still faces a federal civil fine of up to $10,000. But a spokeswoman for the Transportation Security Administration said Thursday that the agency isn't likely to seek the fine. I don't think it is possible to prevent people from bringing a plane down. Period. I don't think more detail here is really fruitful. So the screening is really to prevent assuming control of the plane. My criteria would be 'can twenty men assume control of the craft with these'. 20 leather blackjacks -> no. Even real blackjacks I think. As a chemical engineer, I think there's a long list of engineering types that are more dangerous than a pair of tweezers, a blackjack, or 95% of the other stuff confiscated. The Boeing Museum of Flight here in Seattle has an exhibit of 'Stuff that was confiscated'. It's.... depressing. Here's an experiment for you: board a plane, take off your sock and drop a can of coke in it. Now THAT'S fifty times the weapon this stupid thing was. Or, take some epoxy and a cardboard mold aboard and make yourself a nice edged weapon that's a lot more lethal than most of the stuff they're confiscating these days. The point is, there's no stopping a determined terrorist from getting something aboard. Our only real defense is reinforcing the cockpit door, and the willingness of the passengers to die on their feet rather than their knees. An 8½inch bookmark huh.. scary. Yet a man hops on the same plane with a 40inch leather strap with a great big hunk of metal at one end, and a woman hops on with not one but TWO 8½inch leather items, each containing a 3inch spike at one end.. woah! yup, a belt and a pair of woman's shoes.